So summer is over. Just like that. Truth be told, we didn't have much of a summer. And now it's gone. Sob. (Maybe if I stop reading this blog I might feel better about autumn). So after an afternoon of soaking up the rays while we could, it suddenly dawned upon me that I had nothing to feed the kids. Nothing at all. I usually plan and shop for a week at a time. I had organised a Coles delivery for tomorrow. But I had clean forgotten about today. Oops. I scoured the fridge. A tiny bit if cooked leftover chook (not enough to satisfy the carnivores of the house), a couple of carrots and a bit of broccolini. Pasta? Nup. Rice? A little. Hmmm. Cous cous. Yay. Lots of people don't like cous cous. A friend I used to know calls it cuss cuss. I love cous cous. It is so versatile and can be used cold in salads or served warm with sauces, stews and tagines. The trick?? Please please don't cook cous cous in plain water. You get cuss cuss. Always always use stock. I use home made veggie stock. I often make a yummy cous cous salad, in which I cook the cous cous in oj and stock. The thing about cous cous is that you need the oil. And the butter. And the salt. Otherwise you get cuss cuss! Anyways. So I made the cous cous. Then I sautéed 1/2 a red onion (cos that's all I had) and a couple of cloves of garlic. I added the finely diced carrots and broccolini. 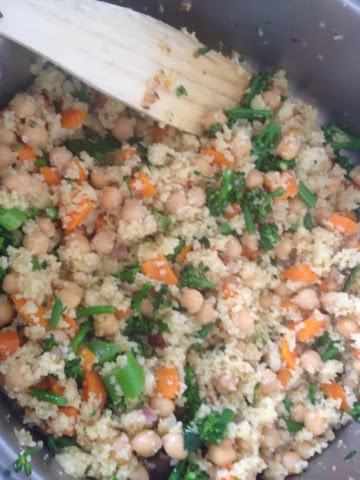 When the veggies were softened I stirred through the cous cous and a tin of drained chickpeas. It was really really yummy. (Oh and the carnivores had the chicken on top! ).